It’s time to right a terrible wrong. 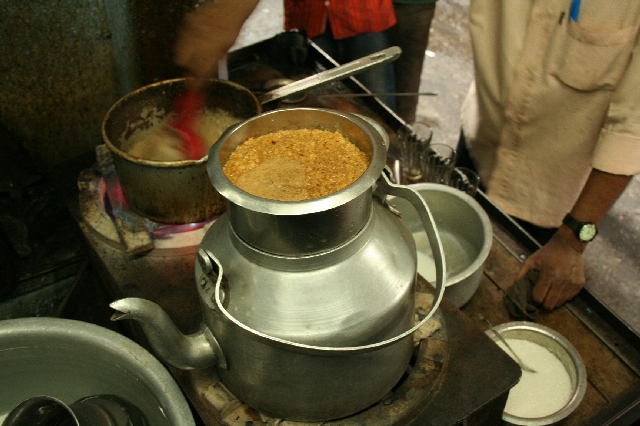 For the past two years or so I’ve been a regular in Old Delhi, delighting in the wonderful street food – most weeks I’m either checking up on a new dish, gorging on an old favourite, begging for recipes or stocking up on crockery for our Uparwali Chai tea parties. We always take visitors for a quick spin and recently I’ve been doing a few food tours too. Whatever the excuse (and I need very little excuse to jump on the Metro to Chawri Bazaar), there are a couple of places I always visit. 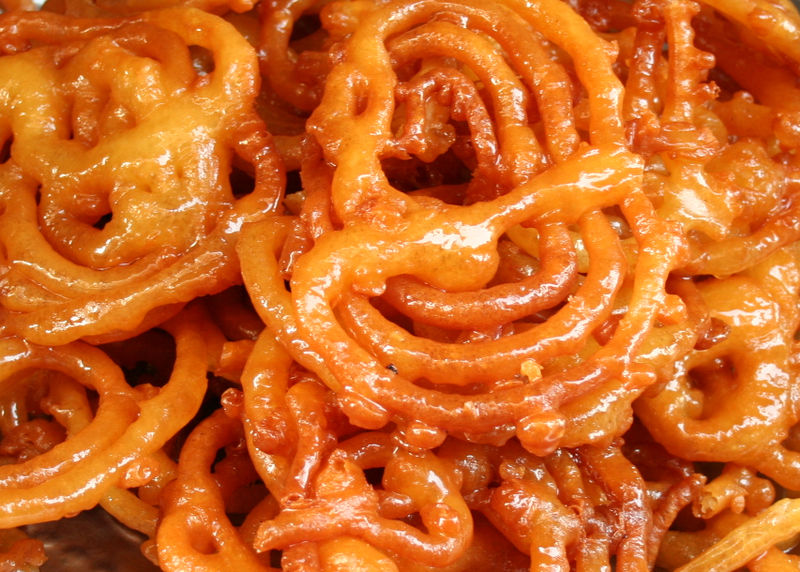 At Bade Mian in Lal Kuan I scoop up a week’s supply of the best kheer (rice pudding) in town; I never miss korma at Ashok and Ashok; I gorge on Daulat ki Chaat whenever it’s in season and I always, always come back with a big bag of sticky, sweet, still-warm jalebis from Old and Famous Jalebiwala. All of these I have written about droolingly, except one. Amazingly, I have never mentioned Old and Famous. Time to make amends. As I sit down to write this, on Diwali night, the lights are twinkling all over our neighbourhood, Delhi’s streets and skies are erupting with fireworks that will build to an all-nighter of explosions. The local children are shrieking, stray dogs are howling and our own pups Spike and Mishti will be gibbering wrecks till morning. It’s going to be a long and noisy night but we’ll sit on the terrace and marvel nonetheless. I recently put together this street food list for The Guardian newspaper to coincide with the Commonwealth Games. I’m not sure how many athletes or officials have managed to get beyond the Games Village canteen to sample Delhi’s incredible street food but for anyone intrigued by Delhi’s wonderful street food, these are just a few of my all time favourites. If you only eat out once during your stay in Delhi, head for Ashok and Ashok: the chicken and mutton kormas here have been known to make grown men crumple. As well as boasting an edgy gangster heritage, A&A make chicken korma every day, mutton korma on Wednesday and Saturday (invariably sold out an hour after opening at 1pm) and biryani. The meat just melts, hinting at a magical mystery masala (apparently up to 30 different spices), pistachios, and a devilish pact with the ghee (clarified butter) tin. Well folks it’s been a while! I seem to have been so busy since we got back from the mountains that I just haven’t been able to apply myself to the serious business of street food. Good to see that some things never change, though – like my fondness for the Hipstamatic app on my iphone (as per above photo). Is it just me or is it really cool? Something else that never changes is the Eating Out in Delhi gang’s dedication to gorging in the gullies. And certainly no-one could ever call us fair weather foodies. This was the scene when when 15 of us stepped out of Chawri Bazaar metro station last Sunday. By the way, as of last Friday I now have a metro station on my doorstep with a direct line into Old Delhi. Top Kebabs and Kheer now minutes away at all times! While idling on Twitter the other day, I came across this recipe for Strawberry Cream Cheese Sandwiches in the British edition of upmarket food magazine, delicious. The accompanying picture, I think, is meant to conjure up lazy afternoons watching Wimbledon with posh snacks but it also reminded me of something a little closer to home. 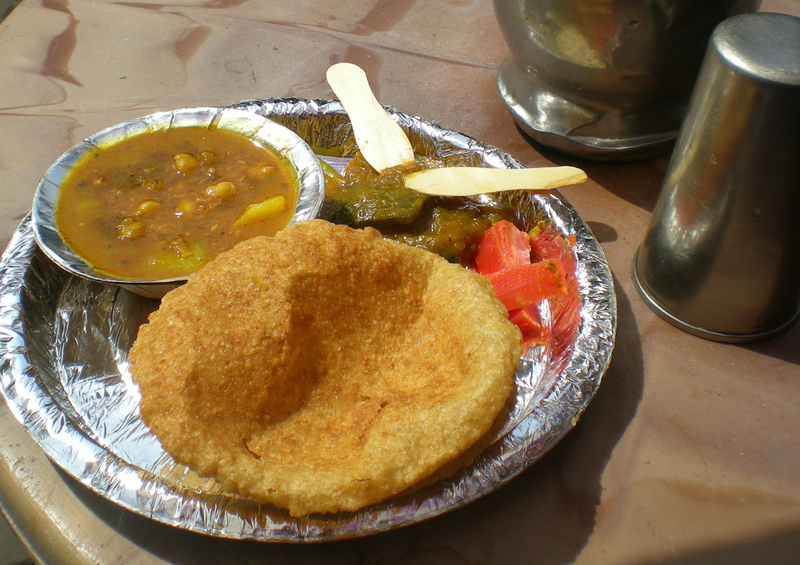 Possibly Old Delhi’s most surprising street food joints is the Jain Coffee House in Raghu Ganj. 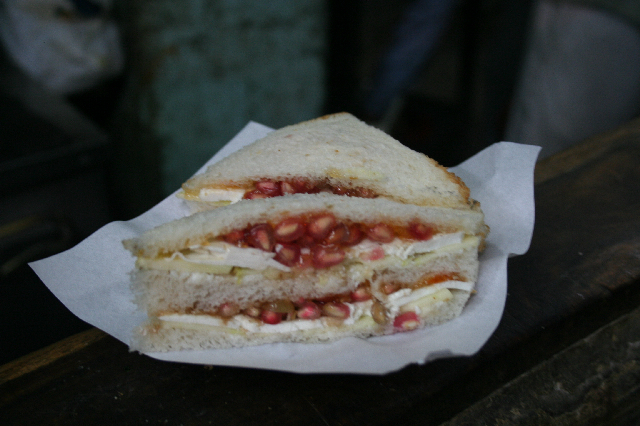 People are always astonished by it, not just because of the location, in a quiet little grain store off bustling Chawri Bazar, but also because of the sweet delicacy of Pavan Kumar Jain’s fruit sandwiches. Sorry for the silence – life seems to have gone a bit crazy around here. 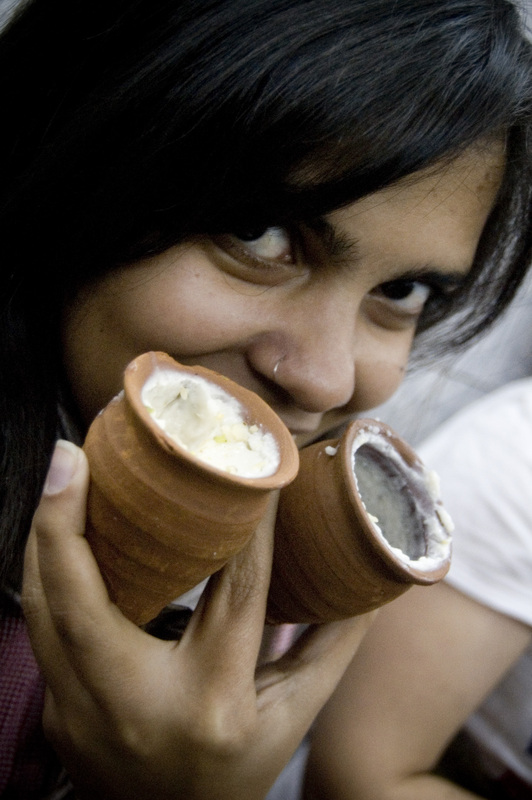 Ever since The Hindustan Times wrote a lovely feature about Eat and Dust a couple of weeks ago, my inbox has been overflowing with offers of exciting foodie projects! One that I’ve been extremely happy to be preoccupied with is a new newspaper column on baking – coming very soon – stay tuned! 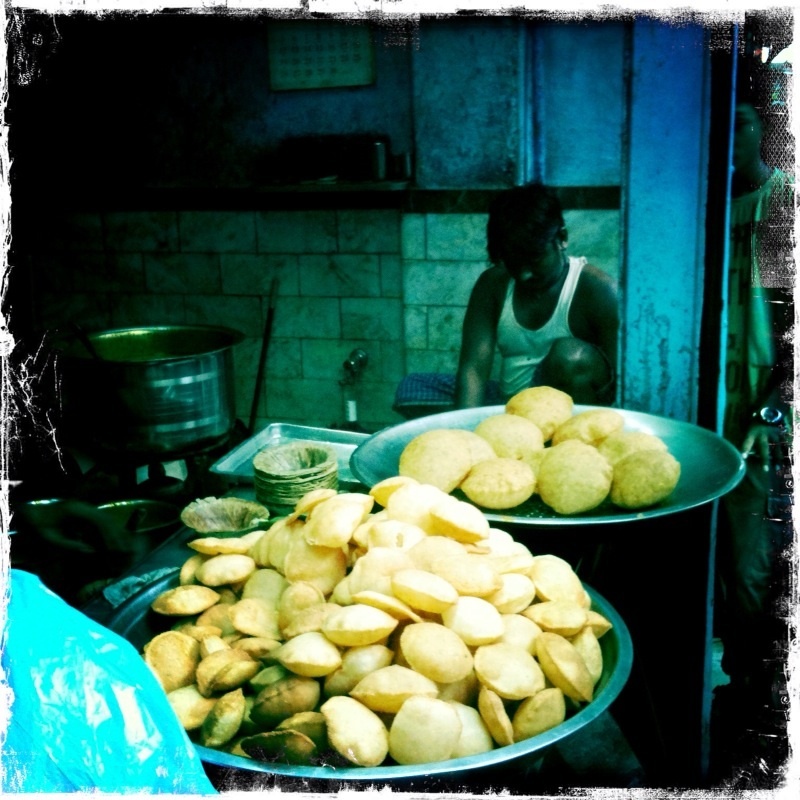 I did, though, still manage a couple of street food forays – and that despite the 42º heat! One outstanding new find – and it took a bit of finding! 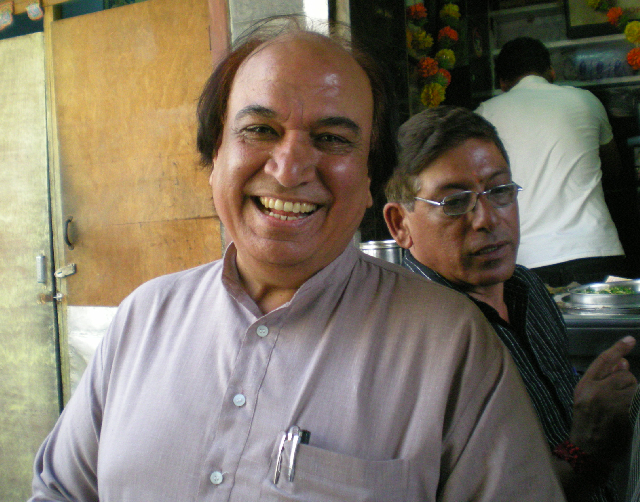 – is Ashok and Ashok’s Meat Dhaba in Sadar Bazaar. 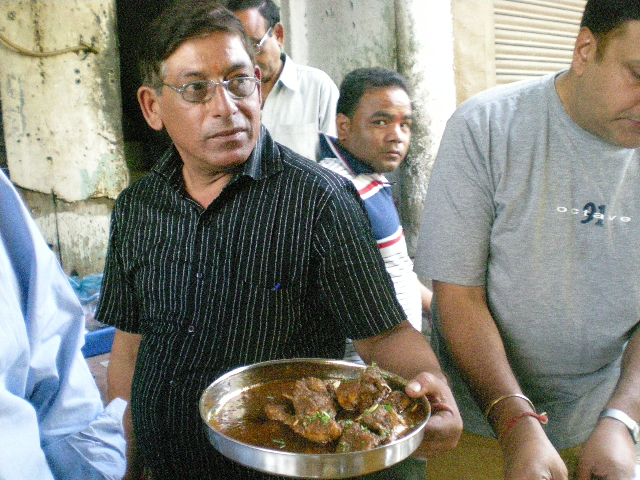 For those in the know, Ashok’s chicken and mutton korma is legendary. The tiny little street eatery also has an extremely macho pedigree. 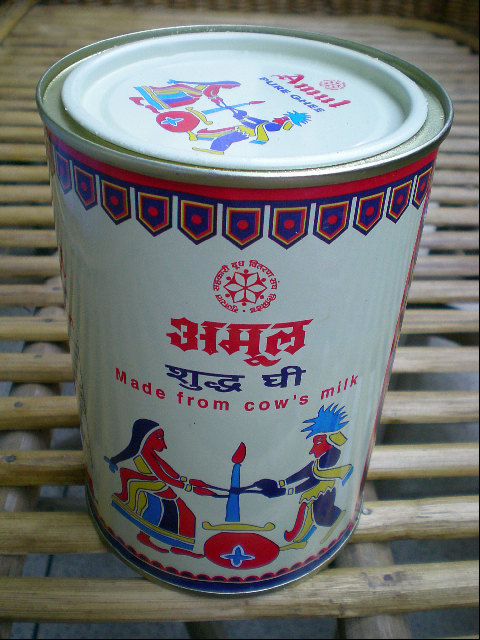 Word has it that the original Ashok and Ashok (now deceased) were, how shall I put this? Locally referred to as ‘toughies’ or ‘hoodlums’, I gather there was a touch of The Sopranos about the two friends, who to curry (!) favour with patrons, used cook up great pots of mutton and chicken. 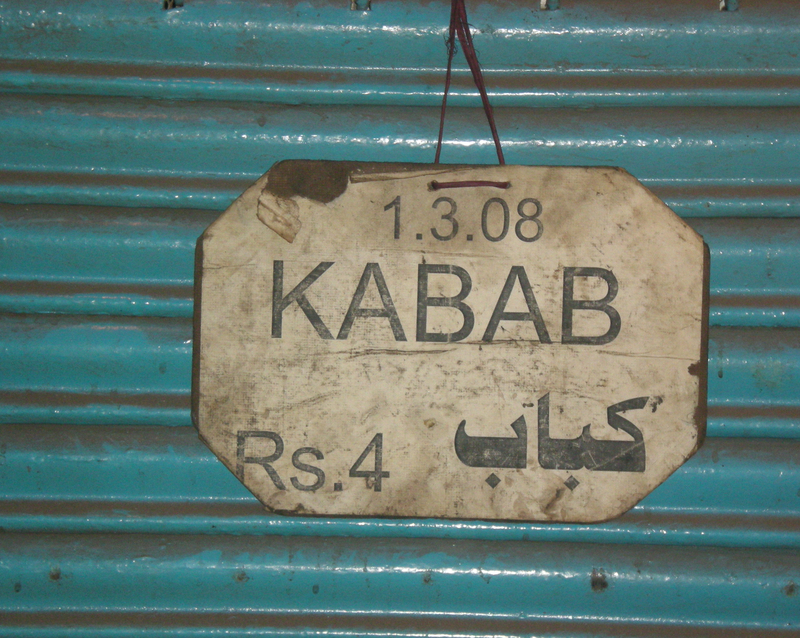 Catering eventually became their main activity and the legend lives on in Sadar Bazar. Chai with Milk Cake is my Old Delhi equivalent of Espresso and Biscotti; a fast, sugary shot in the arm when energy levels are low. If I’m ever at the Fatehpuri end of Chandni Chowk and in need of a quick pick-me-up, I dive straight into Kucha Ghasi Ram and head for Hemchand Ladli Prashad’s lovely little tea stall. I’m definitely developing a very pronounced culinary split personality. The past couple of weeks have seen wall-to-wall macaroons and cupcakes for our recent Uparwali Chai tea party events: cake-stands piled high, pastries nibbled, Assam sipped and pinkies crooked over fine china cups. Happily, I have a seriously sweet tooth but I’m definitely back in the mood for some savoury street fare. Just as well, then, that my friend Rahul Verma, who writes about street food for The Hindu newspaper, has decided to revisit all his favourite old haunts. Rahul first started writing about Delhi’s street food over 20 years ago, so there’s a lot to look forward to over the next few months. Hurrah! 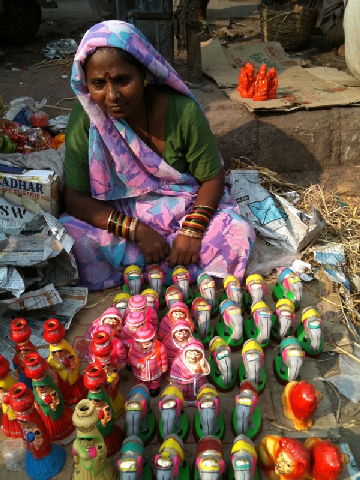 I’d hardly finished reading Monday’s piece about Jain Sa’ab’s Bedmi shop when I was in the car and heading to Daryaganj. A substantial street breakfast was just what I needed to set the right tone for the week and the wide, leafy streets of Daryaganj, dotted with colonial relics and publishing houses make a nice change from the teeming gullies of the old city. So last Saturday those crazy kids over at Dillinet finally persuaded me to take them on a street food walk and in the process made Golgappe, Shahi Tukda and Kebabs look cute, glamorous and lots of fun. Now what I’m about to say may cause a painful parting of the ways in the year’s mission, but I can’t put it off any longer. 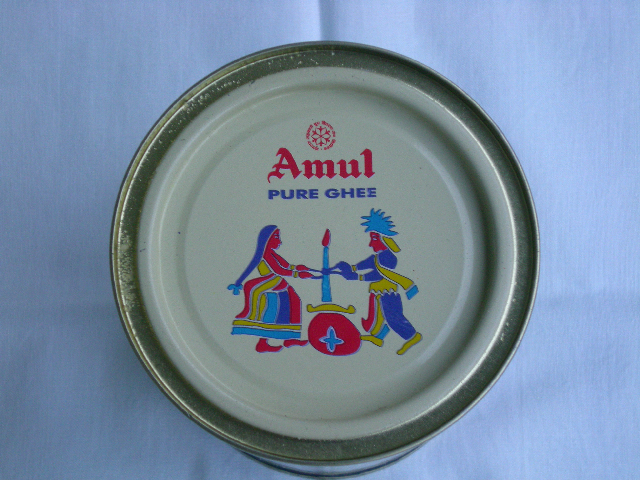 The plain fact is I love ghee, I love cooking with it, I love eating it, I love the way it transforms everything it touches, I even love the beautiful tins it comes from. I could eat it till the cows come home and the way 2010 is shaping up, I’m going to need a lot of cows to come home. I know this may have been a shock and a few of you will now feel the need to form a more meaningful relationship somewhere with ‘health’, ‘low-fat’ or ‘salad’ in the title. I’ll be sad to lose you, obviously, I’ve really enjoyed having you along these last few months, our trips to Old Delhi were really cool, but well, If I couldn’t keep you, you were never mine. Before you go, though, at least concede that the tin is really, really pretty! If, on the other hand, you’re a ghee worshipper, then this is a really, really safe place for you to be and I’m really going to make it worth your while. OK, now we all know where we stand, lets get busy. A few days of grey skies, cold winds and heavy showers here in Delhi have been an excuse, not that I ever need one, to linger under the duvet with something buttery and sugary – preferably with two spoons! One of the most wanton, wtf-I’m-cold-and-in-need-of-comfort dishes I’ve ever come across is Shahi Tukda, the mighty Indian bread pudding.